Dylan finished with 3 Best of Breed wins over specials on 8/30/08. Dylan's major wins: 4 points 6/8/08, under Judge Gayle Gold Creasman, and 3 points, 8/30/08, under Judge Ken Berg. Dylan is owned by and lives with Carol O'Brien, Thanewood Dalmatians, in Durham, NC. He is co-owned with Pam Fisher. Dylan started his quest for his Grand Championship in 2012 handled by Kristen Mooney. He earned an Award of Merit at the Dalmatian Organization of Houston Specialty Show, which had an entry of 100 dogs, following DCA 2012. 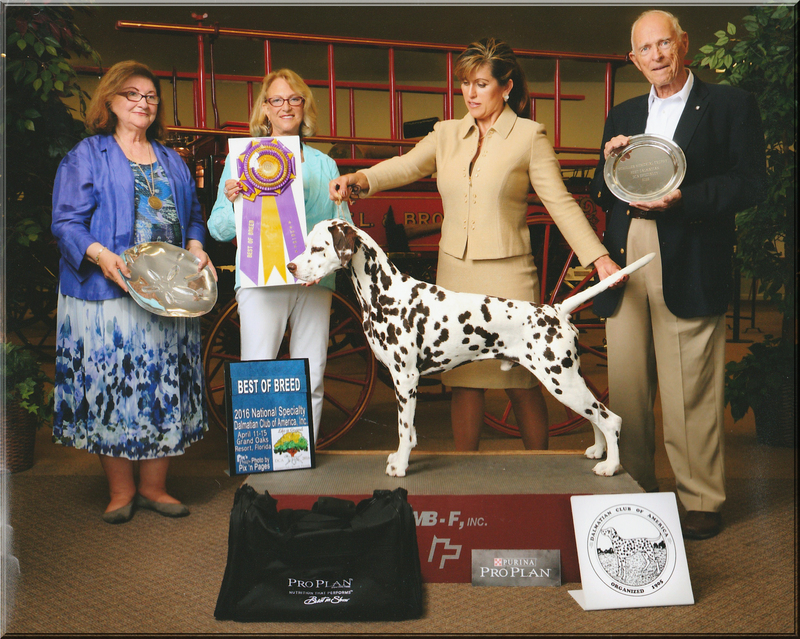 Dylan finished his GCH, with 5 majors, Saturday, July 28, 2012, at the Dalmatian Club of the Piedmont Specialty Show, under Breeder Judge Meg Hennessey, handled by Jr. Handler Samantha Stafford. Dylan ranked in the Top 20 for 2013. He has earned his Bronze Level Grand Championship expertly handled by Kristen Mooney and Russella Bowen. 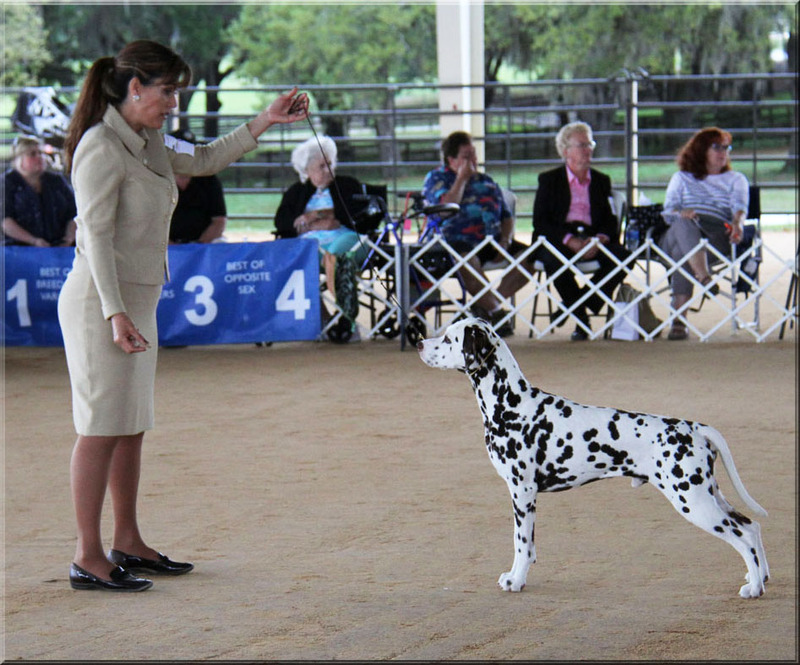 He assisted Samantha Stafford in winning Best Junior Handler at the Dalmatian Club of America National Specialty in April, 2013. Dylan finished up 2013 by taking an Award of Excellence at the AKC Eukanuba National Invitational in Orlando, 12/14/13. At DCA 2014, Dylan earned an AOM under Judge Sue MacMillan. He has earned a number of Best of Breed wins and Group placements in 2014 to qualify him for the Top 20 2014. Dylan earned another AOM at DCA 2015 under Judge Meg Hennessey. In addition to more group placements, Dylan was Reserve Best In Show at the Warrenton KC show, 9/25/15, under Judge Ronald Spritzer. under Judge Keke Kahn. His win was 10 years after his mom Stevie's DCA Best of Breed win. Brown dogs rule! We are incredibly proud of Dylan's success and thank Russella, who is currently his handler, for her expert handling. Contact Thanewood Dalmatians for info and a pedigree.